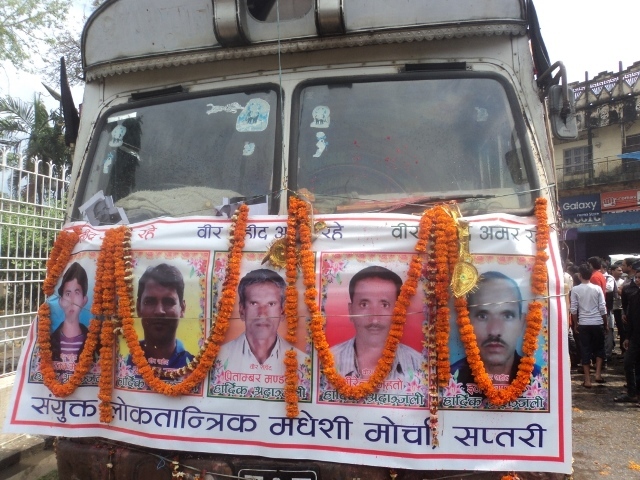 Bodies of five men who were killed in a police firing in Maleth of Saptari district five days ago had been brought to Rajbiraj from the Dharan-based BP Koirala Institute of Health Sciences on March 11. UDNF cadre informed that the rally will be taken to Hanumannagar, Bhardaha, Kanchanpur, Sitapur, Rupani, Kathauni, Kadamaha, Siraha, Lahan based Sahid Chowk , before returning to Rajbiraj at 1 pm. Thousands of cadres and followers had participated in the rally on bikes, car, jeep, magic van and buses. Top leaders of the United Democratic Madhesi Front, including Federal Socialist Forum-Nepal Chairman Upendra Yadav, Sadbhawana Party Chairman Rajendra Mahato and Nepal Sadbhawana Party Chairman Anil Kumar Jha had taken part in the procession from Rajbiraj of Saptari. UDMF Saptari district coordinator Dinesh Kumar Yadav said the bodies would be handed over the concerned families on Sunday and the final rites would be carried out on the same day. 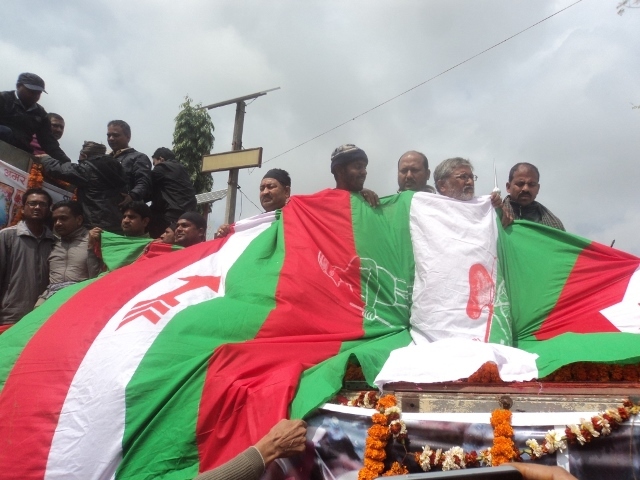 The UDMF cadres Sajjan Meheta, 22 of Maleth-2, Pitambar Mandal, 50 of Maleth-4, Ananda Kumar Shah,42 of Maleth-4, Birendra Mahato and Inardev Yadav, 57 of Prasawani-4 were killed in police firing on March 6 when the alliance of the Madhes-based parties attempted to disrupt the Mechi – Mahakali campaign of CPN (UML), at the Rajbiraj industrial zone.